Documentary series, dir. Caitlin Manning in collaboration with Joe Bender. 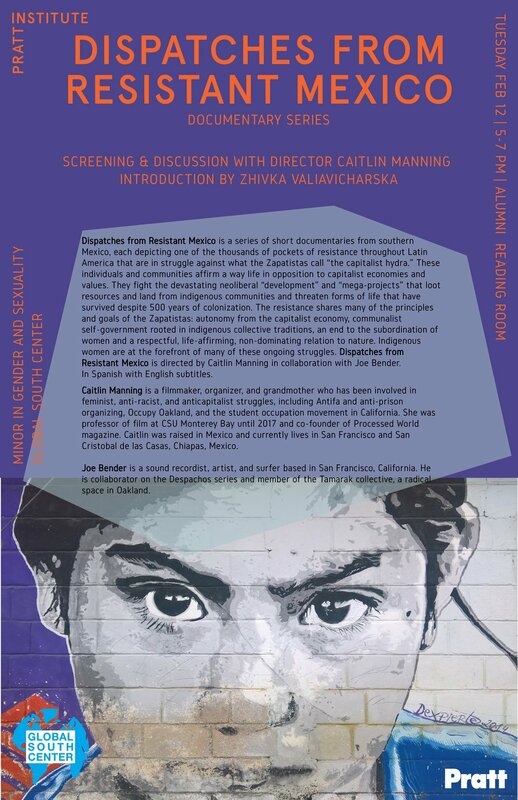 Caitlin Manning is a filmmaker, organizer, and grandmother who has been involved in feminist, anti-racist, and anticapitalist struggles, including Antifa and anti-prison organizing, Occupy Oakland, and the student occupation movement in California. She was professor of film at CSU Monterey Bay until 2017 and co-founder of Processed World magazine. Caitlin was raised in Mexico and currently lives in San Francisco and San Cristobal de las Casas, Chiapas, Mexico. Joe Bender is a sound recordist, artist, and surfer based in San Francisco, California. He is collaborator on the Despachos series and member of the Tamarak collective, a radical space in Oakland.